And you know how the ‘solution’ is to start up a whole new console with Start > [program] > Right-click > ‘Run as administrator’? And how you have to ‘cd’ back to where you were, and you don’t have access to the shell session you were working with? Have you ever wished you could just ‘sudo <whatever command just failed>’, like you’ve been able to do on every other OS since the year 2000? I kept wishing this, almost daily; until finally I couldn’t take it any longer and created a sudo for Windows. Written in Powershell. 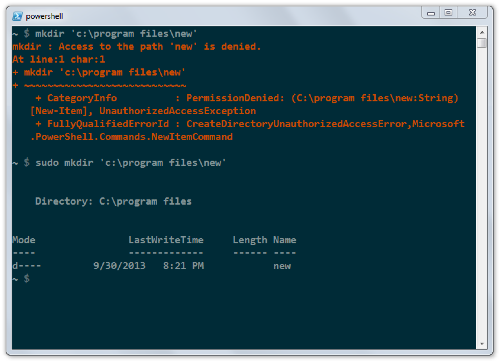 Works from cmd.exe too, if installed with Scoop (command will be executed under Powershell).